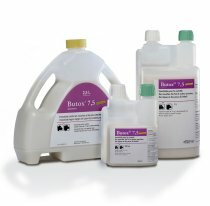 Butox® is a range of formulations containing the synthetic pyrethroid deltamethrin as an active ingredient. It is for the control of ectoparasitic infestations in cattle and sheep caused by ticks, lice, flies, mites, midges and keds. A concentrate for dilution in water.